JBrickBuilder has a pretty straight forward way of changing colors. Click the “Change brick color” button, select the color you want and then start clicking on parts to change the color. To exit color change mode, just press ESC. You can also select a group of parts, choose the color you want and then click the “Change brick color” button and it will change the color of all the parts you have selected. As you use colors, it will maintain a history of them on the right side so that you can easily go back to frequently used colors. This list appears to reset every time you run the program. There is no way to favorite a color, just the frequently used list. Summary: Fairly simple and straightforward color management. LDCad’s color changing wasn’t as straight forward as I thought it would be. I figured that if I selected a part and then chose a new color it would change the color, that wasn’t the case. Whether or not you have a single part, or multiple parts selected, you actually have to click the current, selected color from the color bar to apply that color. Nothing really bad, just didn’t expect that. It makes sense, and it also prevents accidentally changing color. Summary: LDCad’s color management system is pretty powerful and makes it quick and easy to manage colors. Note: The new 1.5 Beta 1 version allows you to have multiple color bin windows, docked or floating, so you can customize all you want! LDD “paints” parts. You click on the “Paint tool” from the tool bar and then you can select the part you want to change color. 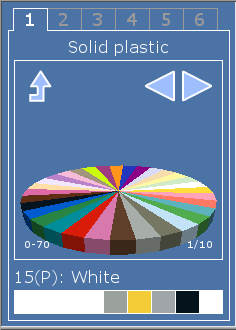 Once you click the part you can then choose the color from a list of colored parts. One thing that doesn’t appear possible, even with groups, is to change the color of more than one part at a time. This could really be a pain if you had a lot of parts that you wanted to change or if you wanted to experiment with different color schemes for your model. There is no favorite or recent color list to choose from that I could find. Summary: Fairly simple to change colors, but inability to change the color for multiple parts at once could make for a lot of extra work when changing colors. LeoCAD “paints” parts similar to LDD. You have to click on the “Paint” tool from the tool bar and then you select the part you want to change color. The part will change color based on the color you have selected from the color palette. Like LDD, there’s no way, that I could find, to change the color of multiple parts at once. Again, this could be really annoying and time consuming if you have lots of parts you want to change color, or if you are experimenting with different color schemes for your model. There was no favorite or recent color list to choose from that I saw. Summary: Fairly simple to change colors, but limited by it’s ability to only change the color of one part at a time. MLCad, color changing made easy. Select your part, or parts, and then click the color from the color bar that you want them to be. Plain and simple. Summary: Simple and straightforward color management. MOC Builder, color changing made easy. Select your part, or parts, and then click the color from the color bar that you want them to be. Plain and simple. SR 3D Builder’s color management was pretty straight forward as well, select the part or parts that you want and then click the color you want them to be. If you have multiple parts selected it will pop up a warning asking you to confirm that you want to change the color for multiple parts. Not sure I like that or not. There wasn’t much difference in how each program handled color management, aside from not being able to change the color of more than one part. What ended up being the deciding factor was what a program did to differentiate itself from the others and make it easier to color your parts. LDCad’s part bin concept (and the ability to have more than one in the latest beta version), along with favorites and a history sealed it’s victory for me.